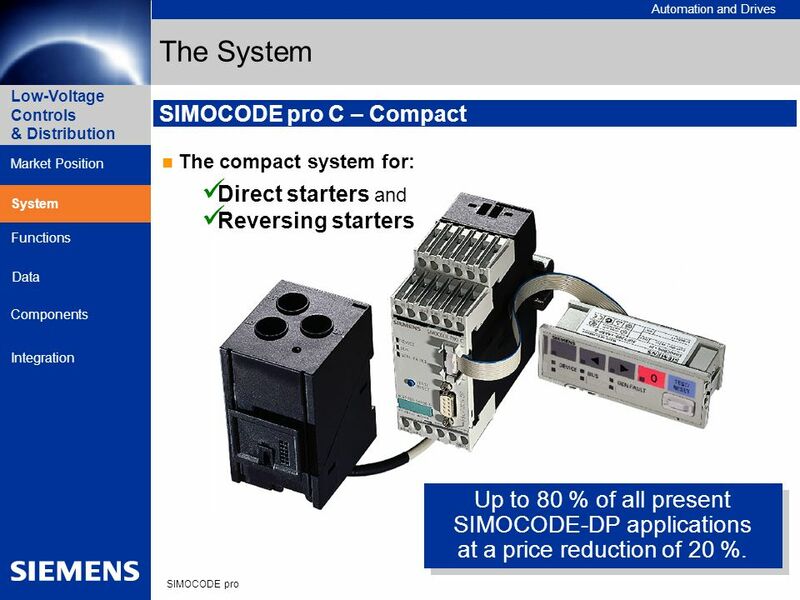 SIMOCODE pro C – Compact The compact system for: Direct starters and Reversing starters System Up to 80 % of all present SIMOCODE-DP applications at a price reduction of 20 %. 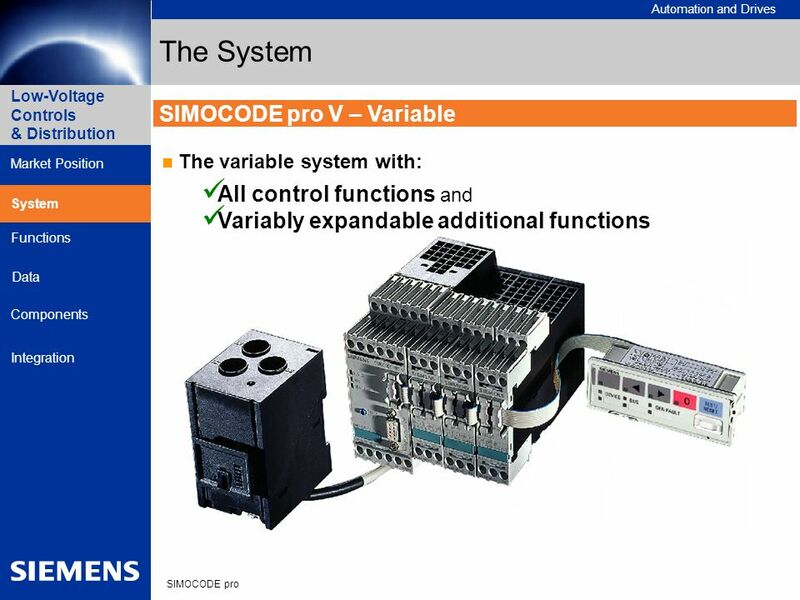 The variable system with: All control functions and Variably expandable additional functions System Note: SIMOCODE pro V is downward-compatible with SIMOCODE pro C and, in addition to all SIMOCODE pro C functions, offers many additional functions. 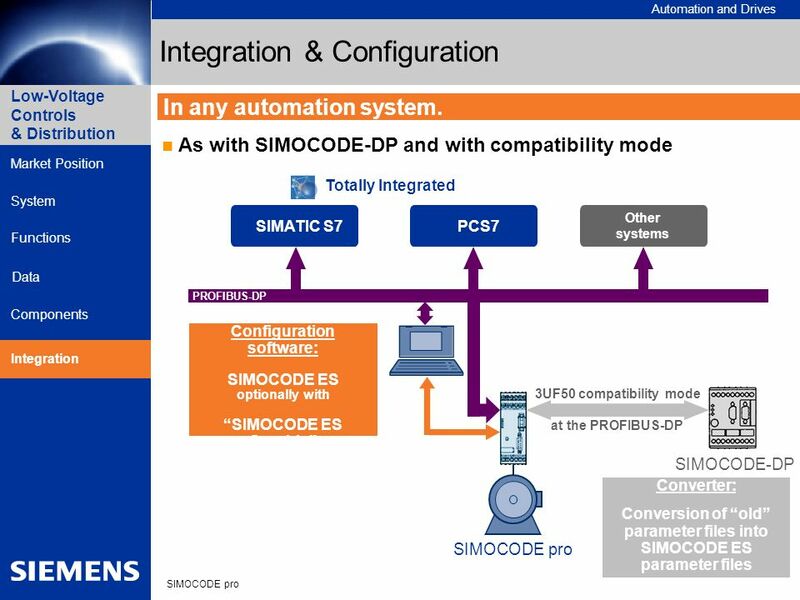 The parameterization of SIMOCODE pro C can be adopted unchanged. 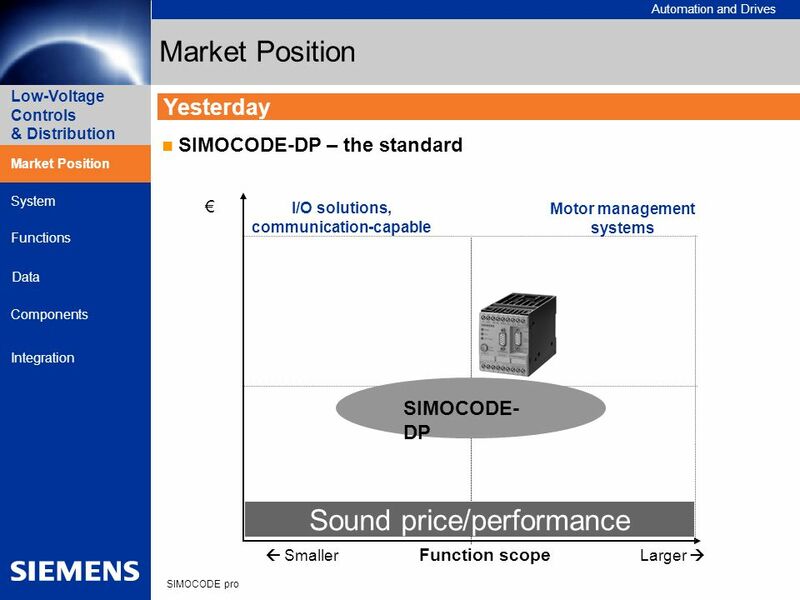 The Functions Based on SIMOCODE-DP. 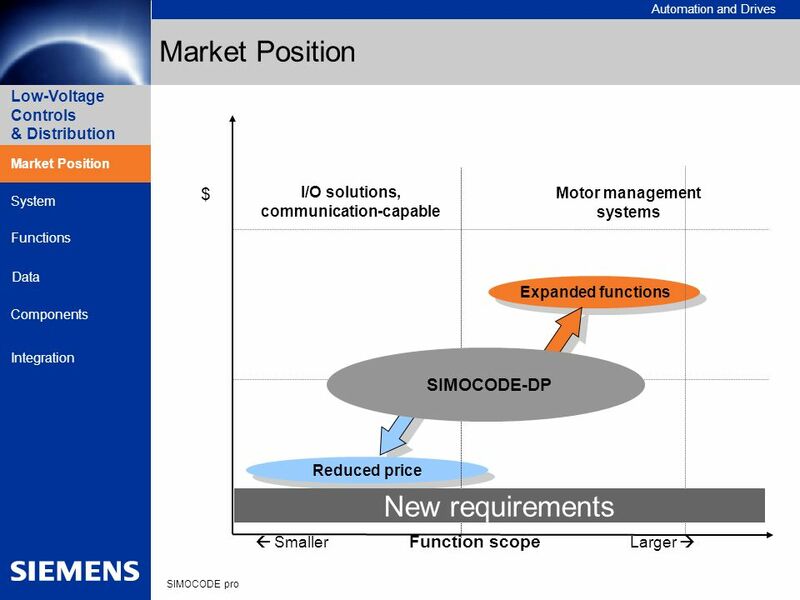 SIMOCODE pro is a flexible and modular motor management system for motors used in low-voltage applications. 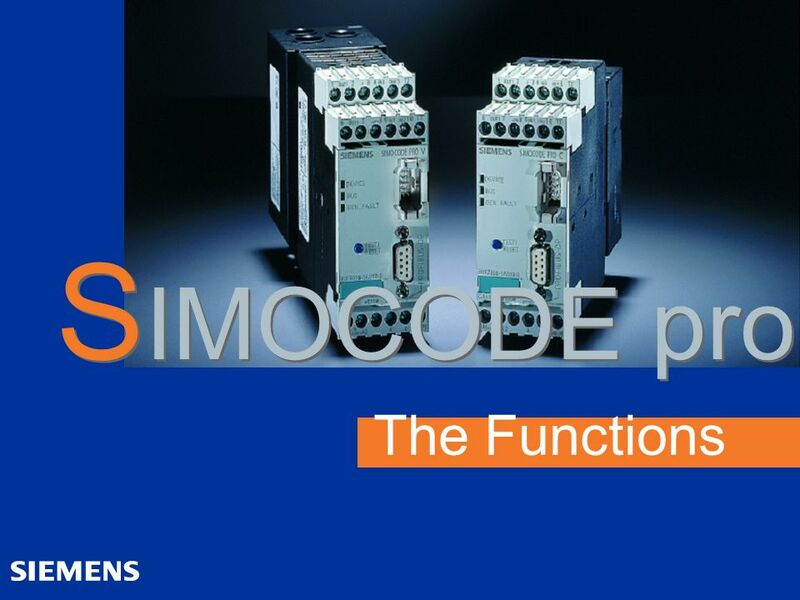 Functions SIMOCODE pro integrates the following features in only one system: Multifunctional electronic motor protection Flexible software for motor control Detailed operating, service and diagnostics data Communication via PROFIBUS-DP All functions known from SIMOCODE-DP have been revised and improved in terms of flexibility. Many new functions have been integrated. 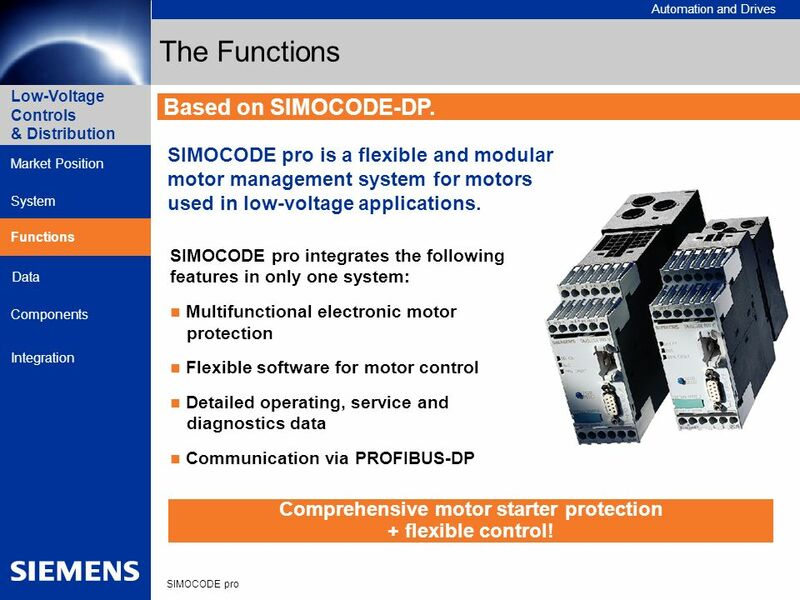 Comprehensive motor starter protection + flexible control! 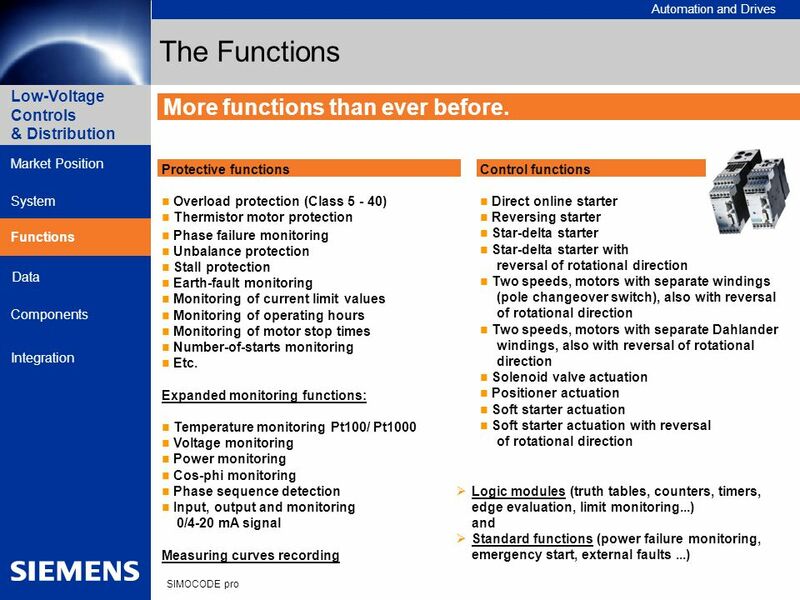 13 The Functions More functions than ever before. Operating data Motor switching state (on, off, left, right, slow, fast) Current in phase 1, 2, 3 and max. current Voltage in phase 1, 2, 3 Effective power Apparent power Power factor Phase unbalance Phase sequence Time to trip Motor model heating Remaining motor cooling time Temperature (e.g. motor temperature) Current analog signal value Etc. 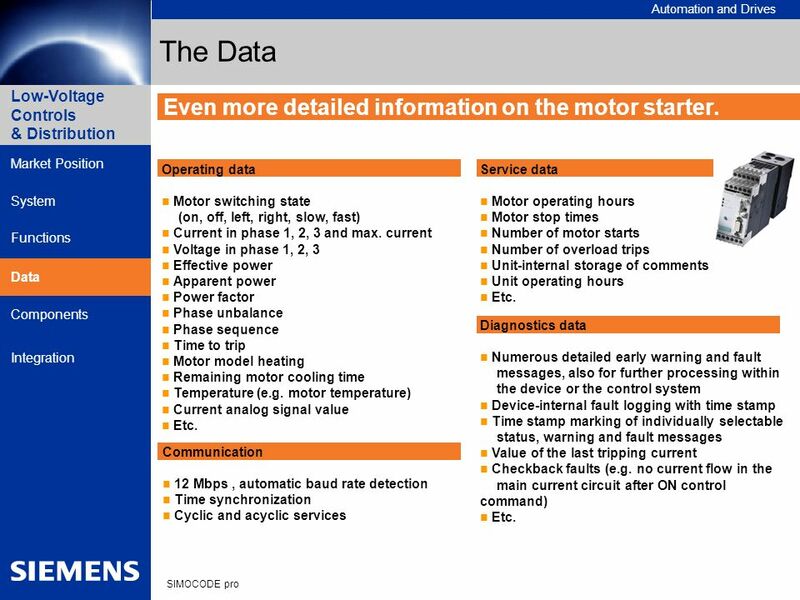 Service data Motor operating hours Motor stop times Number of motor starts Number of overload trips Unit-internal storage of comments Unit operating hours Etc. 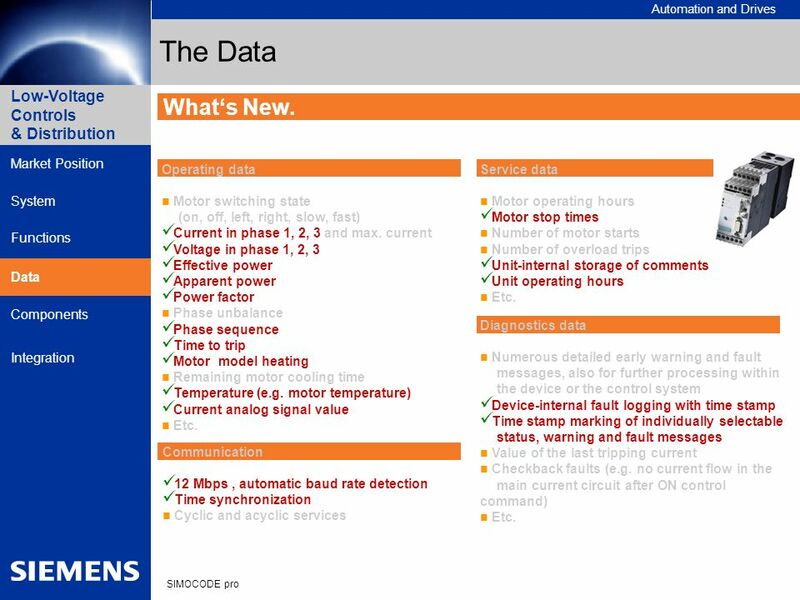 Data Diagnostics data Numerous detailed early warning and fault messages, also for further processing within the device or the control system Device-internal fault logging with time stamp Time stamp marking of individually selectable status, warning and fault messages Value of the last tripping current Checkback faults (e.g. no current flow in the main current circuit after ON control command) Etc. Communication 12 Mbps , automatic baud rate detection Time synchronization Cyclic and acyclic services The data With these data, you receive an even more comprehensive picture of your motor feeder and are always up-to-date. 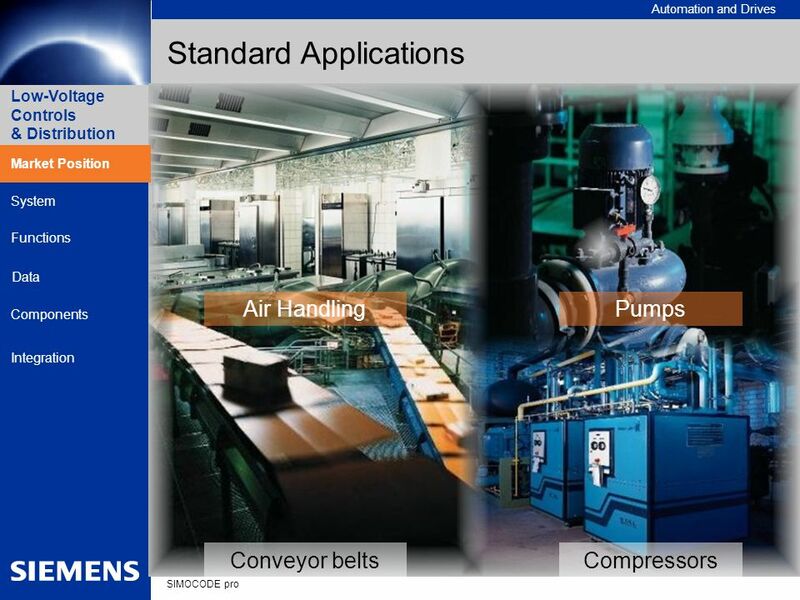 The additionally integrated maintenance-relevant functions support the maintenance and service personnel. 0.3 A – 630 A Straight-through/ busbar connection technology 4 I / 3 O binary Thermistor PROFIBUS-DP 24 V DC / 110 – 240 V UC Basic Unit 1 Components Connection Cable In various lengths (up to 2 m) Operator Panel 5 buttons / 10 LEDs Basic Unit 1 (BU 1) as basic component The basic unit forms the basic component of the SIMOCODE pro C system. The approximate bisection of the width compared to the previous device to a width of merely 45 mm is an essential novelty. 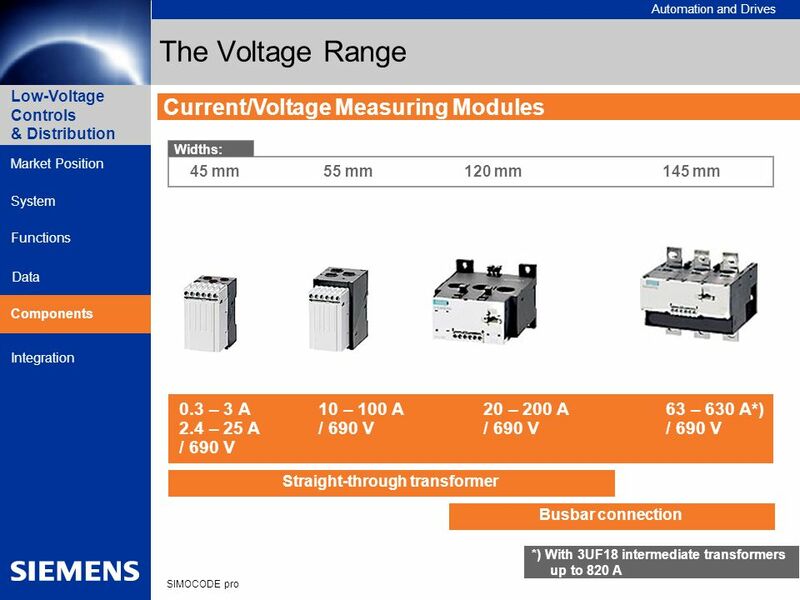 The new wide-voltage range (110 – 240 V AC/DC) for the supply voltage grants enhanced application flexibility. As a matter of course, a 24 V DC version is also available. 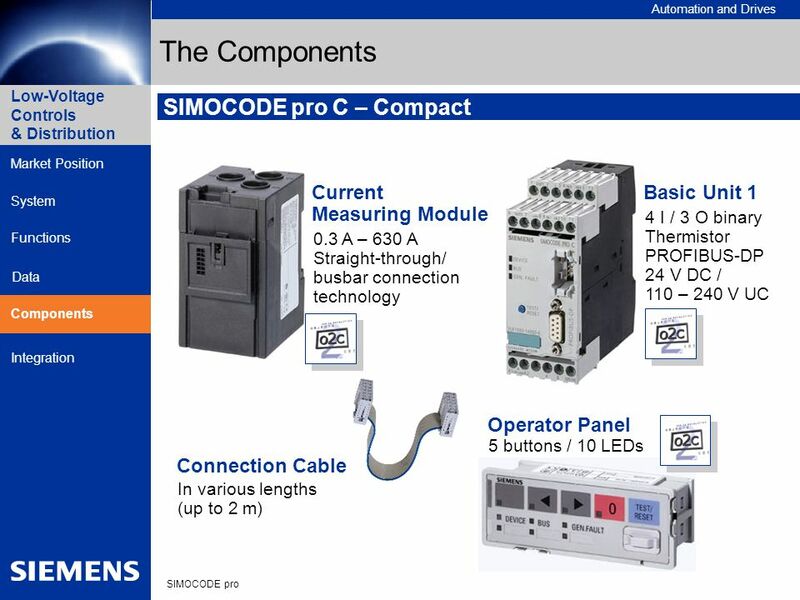 Practical - the thermistor connection integrated in the basic units. Additional evaluation units can therefore be dispensed with. The features known from SIMOCODE-DP such as 4 binary inputs (24 V DC internal supplied), the 3 monostable relay outputs as well as the PROFIBUS-DP connections are also embedded in both basic units (SUB-D and terminal connection). Note: Now one relay output less at the basic device. The operator panel (OP) facilitates motor feeder control via the control cabinet Halved height – identical width ... and yet expanded functionality! With a surface of only 36 x 96 mm (H x W), the new operator panel can replace 5 conventional pushbuttons and 10 LEDs. With the now freely assignable 4 pushbuttons and 7 LEDs, the new operator panel now offers an even expanded functionality while offering space savings of up to 50 % in comparison with the previous devices. Note: One additional pushbutton and additional LEDs – and still reduced space requirements. 20 Commissioning of a motor feeder within seconds. 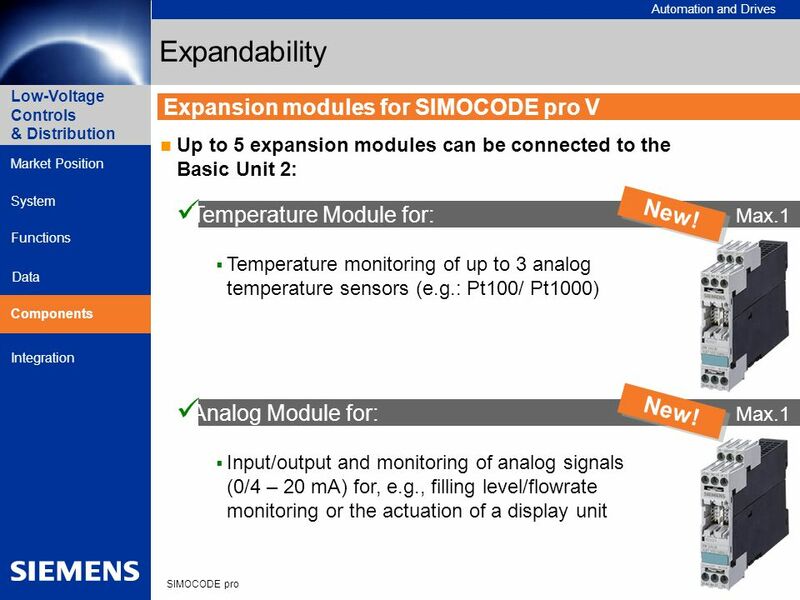 Up to 5 expansion modules can be connected to the Basic Unit 2: Temperature Module for: Max.1 Temperature monitoring of up to 3 analog temperature sensors (e.g. : Pt100/ Pt1000) New! 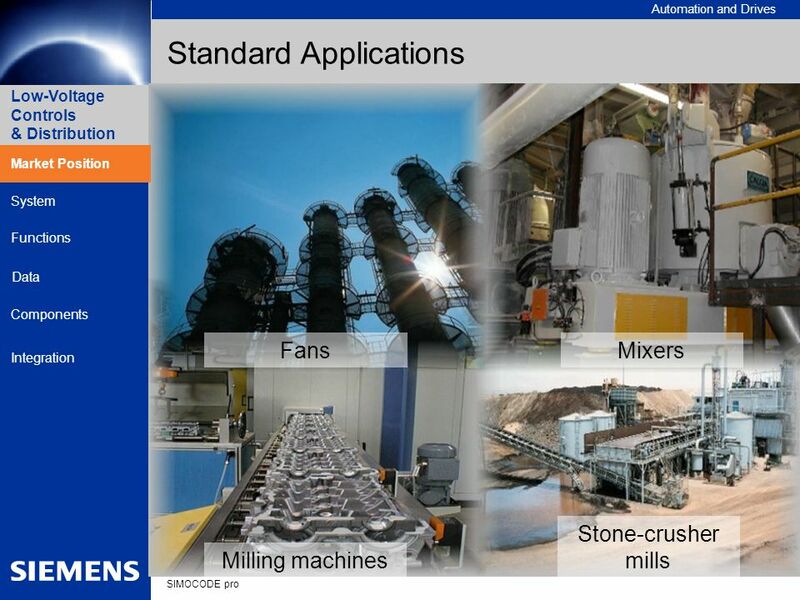 Expansion by analog temperature detection and monitoring Beside temperature monitoring using binary PTC resistors, motors are often also monitored via analog temperature sensors. Irrespective of the thermistor motor protection, the new temperature module (22.5 mm) facilitates the connection of up to three analog temperature sensors (e.g. 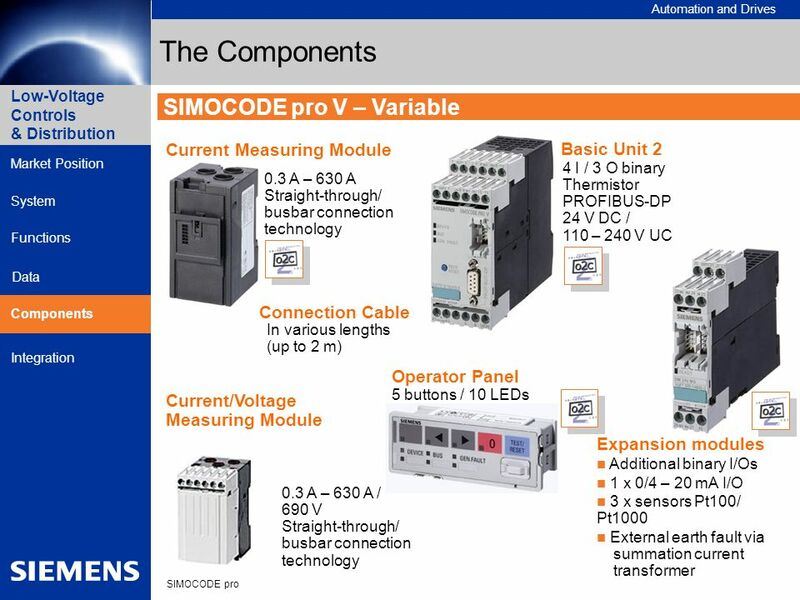 : Pt100/ Pt1000) to the SIMOCODE pro V system. 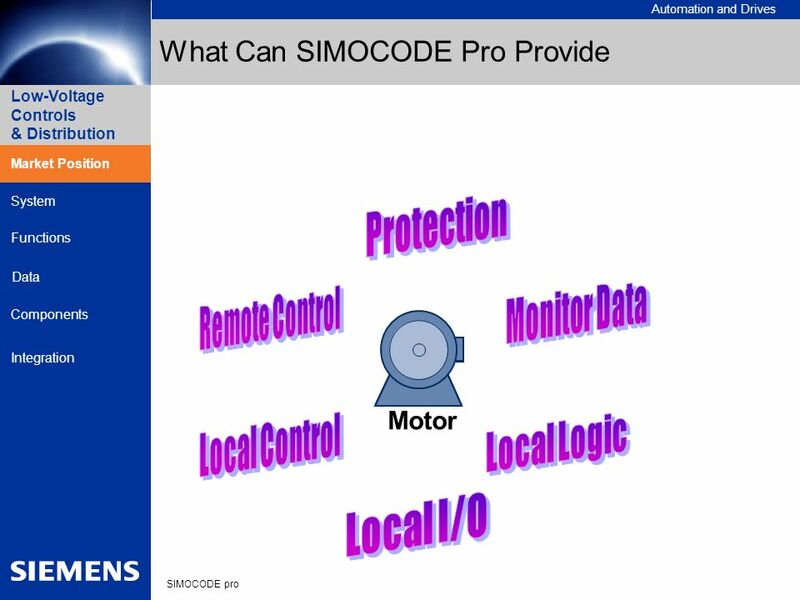 SIMOCODE pro V detects and monitors the current motor temperature and forwards it to the automation system. Note: Sensor measuring circuits in three-conductor technology. Within the system, only one temperature (the max. temperature) of all measuring circuits is available. 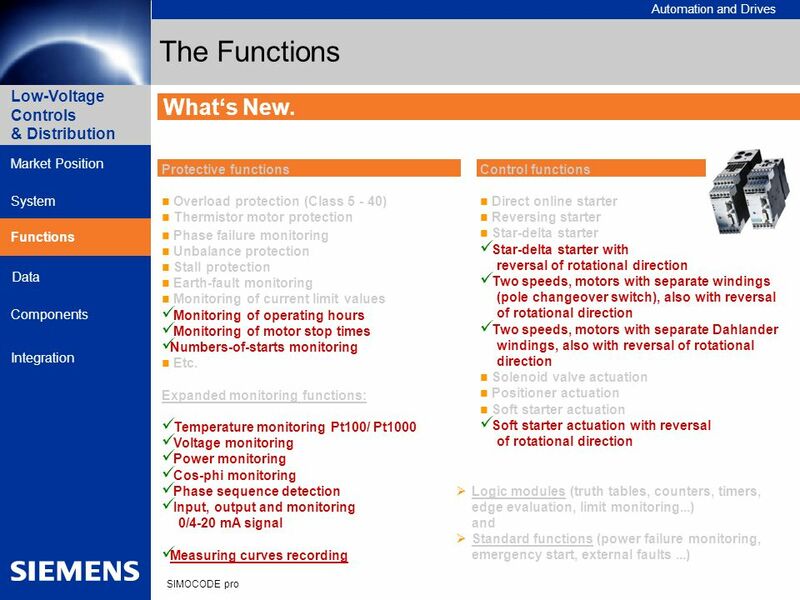 Expansion by an analog input and output (0/4 – 20mA) Are filling levels, flowrates or positions also to be detected and monitored? 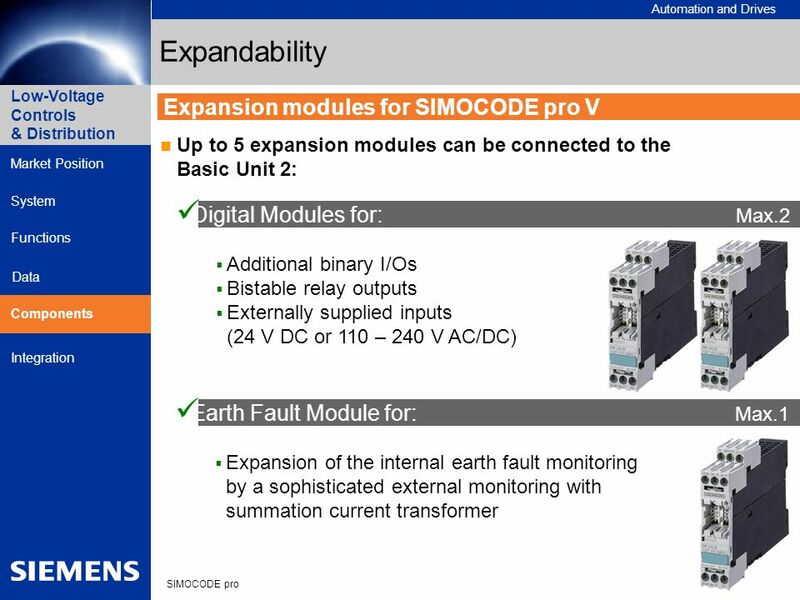 If so, SIMOCODE pro offers the suitable expansion module. 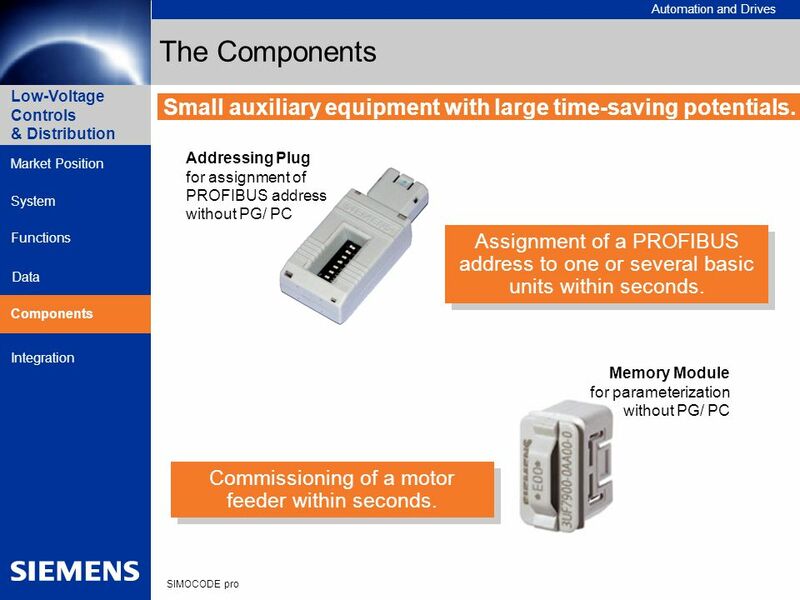 The optional analog module (22.5 mm) facilitates the detection, monitoring and output of a 0/4 – 20 mA signal and offers free access to the automation system via PROFIBUS-DP. 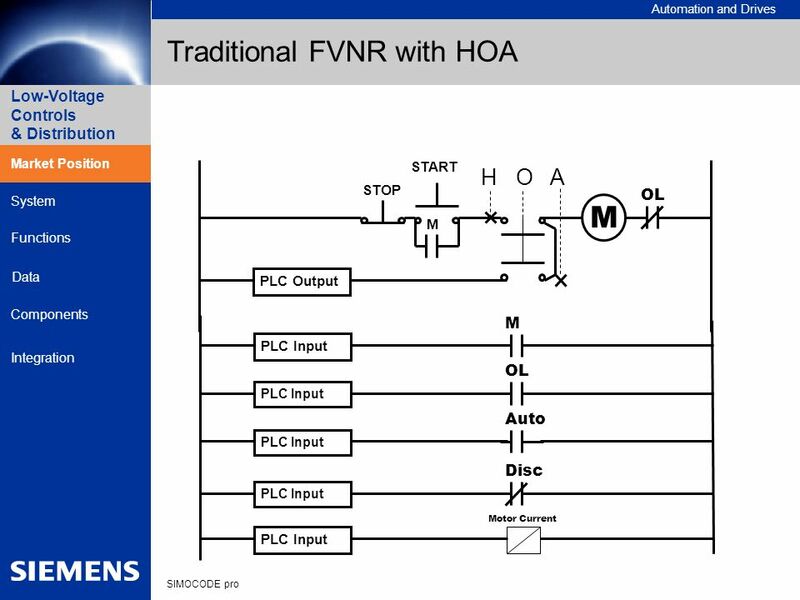 Note: The analog output can be assigned with any “analog value” available within the system (e.g. 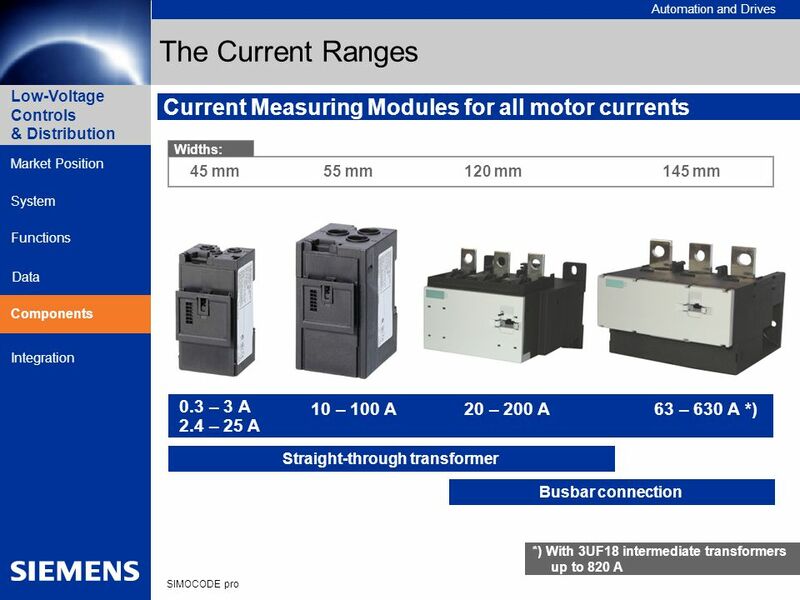 current motor temperature, phase current, voltage, actual timer value, actual counter value, etc.). The conversion of a 4…20 mA signal into a 0…20 mA signal is also possible (…and, of course, the other way around). Components Analog Module for:	Max.1 Input/output and monitoring of analog signals (0/4 – 20 mA) for, e.g., filling level/flowrate monitoring or the actuation of a display unit New! 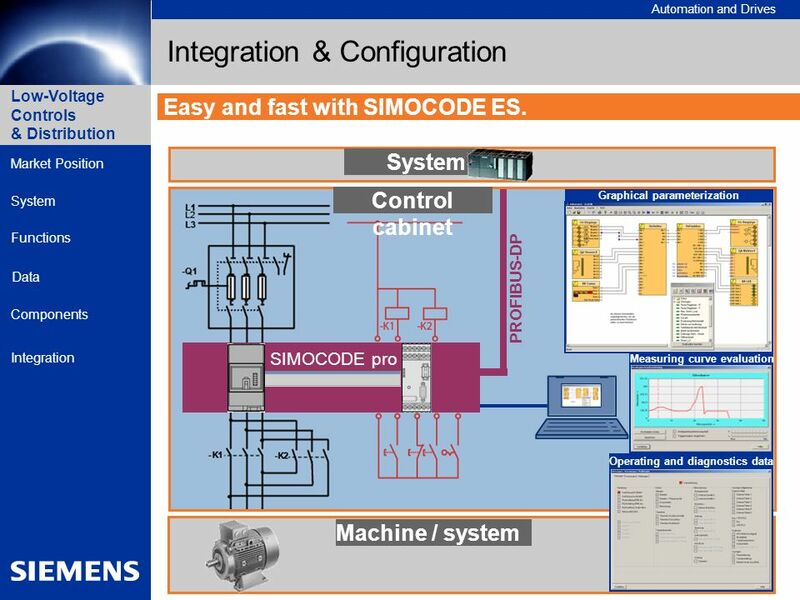 Clearer structure with SIMOCODE ES Graphic. 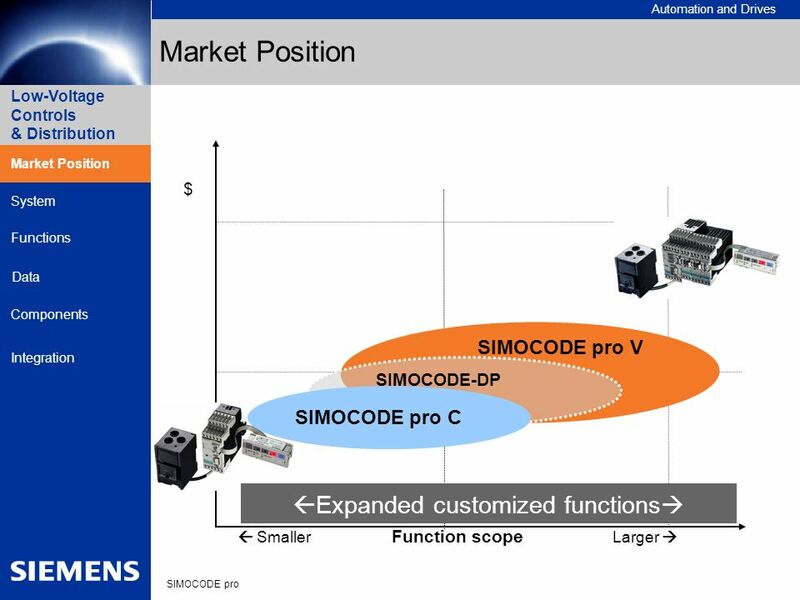 SIMOCODE ES Graphic The optional software package for SIMOCODE ES facilitates a very ergonomic and user-friendly parameterization via “Drag & Drop.” The inputs and outputs of the function blocks can be graphically linked and parameters can be set. Thanks to individual comments, the configured functions can be described in detail and the device parameterization can be graphically documented. – This speeds up commissioning and “visibly” simplifies documentation. Integration For a more detailed description of the configured functions, comments can be embedded. Representation of a preliminary version! 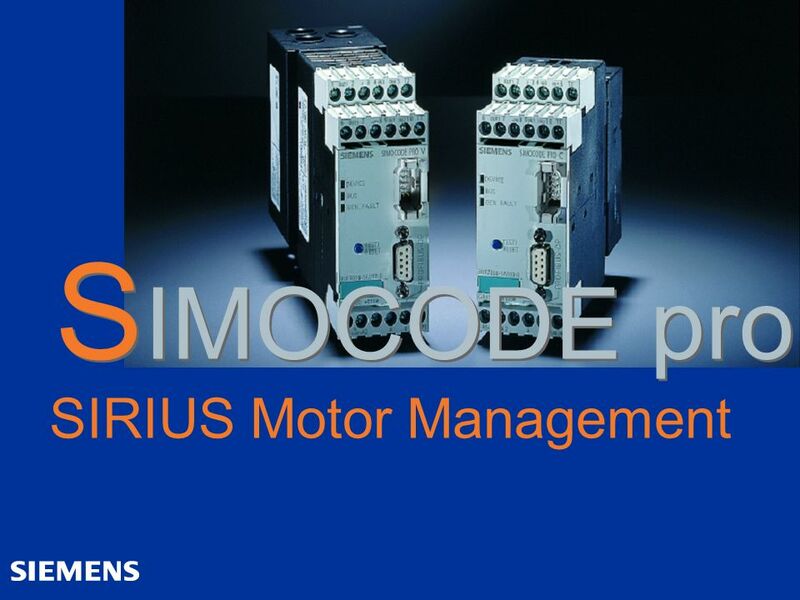 Download ppt "SIRIUS Motor Management"
SITOP power facets A&D SE PS SITOP power Automation and Drives SITOP power flexi The power pack handles it all - from 3 to 52V SITOP power. Dr. HABEEB HATTAB HABEEB Dr. HABEEB HATTAB HABEEB Office: BN-Block, Level-3, Room Ext. No. : 7292 UNITEN.